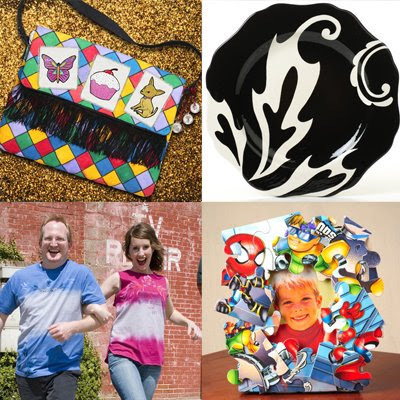 – Make this Fringed and Fabulous Laptop Bag using Crafty Chica™ Iron-on Appliques™. – This elegant black and white plate uses Concepts™ Glaze for Bisque and Majolica. – This Pieces of Fun Frame uses Aleene's Platinum Bond Super Gel. – Revamp your old shirts using into Flaming Skull creations using Tulip® Permanent Fabric Dye and Tulip® Sticky Fabric Stencils™ . – Make easy candleholders with Inspired at Home. – Turn your favorite collection into cool, new jewelry with Jennifer Perkins of Naughty Secretary Club. – Crafty Chica™ wants to hear all about your ideas. Learn how to submit one today! 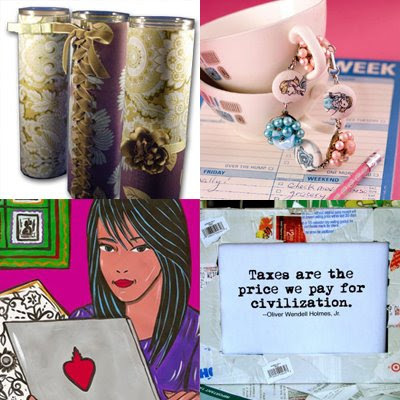 – In honor of tax day, create a frame using old receipts and UPC stickers.